You can homeschool because you were a teacher. I get this a lot when I tell people that I’m a homeschooling mom. Does my early childhood education help me in homeschooling? Probably. Does it “qualify” me to homeschool? No. There are thousands of homeschooling families who come from all sorts of backgrounds… salespeople, accountants, nurses, researchers, and mechanics… this is what makes homeschooling so rich! I spent 20 years working as an early childhood professional. While my profession gave me some insight into planning and implementing curriculum, it never taught me how to teach my children. Want to know what qualifies me to homeschool? I’m my children’s mother. I know my kids. I know what they like and don’t like. I know what excites them and what motivates them. I know their patterns and their moods. I know my kids and for me that is the biggest qualification for homeschooling. Aren’t you worried about socialization? Oh this one irks me. Are you saying that just because they’re not in school, they’re not socialized? WHAT?! First off… define socialization and tell me why schools get all the credit for “socializing” our children? If we’re talking about the opportunity to make friends, my children have plenty of chances to connect with other children and to interact with members of our community. I have nothing else to say on this matter. No, I won’t be homeschooling them through university. Wait, what?! I misunderstood that question? My children can go to university just like any other kid. They’ll go if they want to go and they’ll apply for admission like anyone else. I realize the intent behind this question. People who ask this are often wondering if homeschooling will negatively impact my children’s eligibility for university. I’m ensuring my children get the best education possible. I wouldn’t dream of sacrificing my children’s eligibility for post-secondary education. I love telling people about my homeschooling journey. I could talk for hours about our experiences and activities. However, often when someone is asking this, there is often a snarky look on their face and they’re expecting me to say we eat popcorn and watch TV all day long. Seriously? What do you think I do with them all day? I teach them. Every day. All day. Even outside of our “structured” learning time, I’m teaching them. Aren’t you worried they won’t be at the same level as the other kids? This is a subtle way of asking if I’m doing a sufficient job of teaching my children. My daughter is in grade two and she reads at a grade six level but she writes at a grade one level. She’s a whiz at math and science but up until this year, didn’t do as well in social studies. Her “levels” are all over the place and this is the same for many other kids whether they’re homeschooled or not. Just because they’re in school, doesn’t mean they’re functioning at the “same level” as all the other kids. We all have areas that we excel in and areas that we struggle in. As a homeschooling parent, I can embrace this and work with it. You must be a good parent. Yes, I think I am a good parent but this has nothing to do with the fact that I homeschool my kids. While there are many “good” parents who homeschool, I’m certain there are parents who aren’t as “good” who homeschool as well. I know many FABULOUS parents who don’t homeschool. What does this kind of statement say about them? “Good” parent and “bad” parent; “good” mom and “bad” mom; “good” dad and “bad” dad are terms that should be avoided in all conversations. Why are you homeschooling? You only have 2 kids! Really?! I actually get this one a lot from fellow homeschoolers. How many children do I need to have to make me eligible to homeschool? Parents can homeschool their children whether they have one child or nineteen children. It’s their choice. Do you get frustrating statements when you tell people that you homeschool? What comments rile you up? I can relate to so many of these. I get “You must be so patient!” a lot. No. No I am not. But I am trying to get better. I get a version of number two: “Are you gonna homeschool through high school?” They are 4 and 6. Slow down. I have a few years to decide. Another great post!! And congrats on Huff Po! So exciting!! Oh my goodness, I get the “you must be so patient” line too! I’m totally NOT! I have to take deep breaths… all, the, time. Thanks for the warm congratulations. I am pretty excited! Jennifer, I am so sorry some people have to be this ignorant in asking questions such as above, but I will say for the teaching one, I did teach and don’t ever delude myself into thinking I could homeschool my own kids better then someone who may not have been a teacher. So, in my estimation again this is just plain blanket statements from people who just don’t think it through before they actually do speak. Hugs to you and again sorry you have to qualify or dignify any of this with responses. xoxo!! I loved hearing your thoughts on this Janine. Thank you so much for your kind words and reassurance. I hear so many of these! Ugh. I also get, “He has special needs that should be met at a SCHOOL!”. No, he has special needs that get met at home, thank you very much. Ugh- that’s just rotten. Good grief, the things people say! I am actually planning on homeschooling my toddler and I’m sure I’ll be asked those questions but you have surely prepared me. There’s a lot that I don’t know and thankfully you’ll be there to guide me along the way. You’re an amazing mom, teacher and friend and your kids can only benefit from your teachings. Here’s to a fantastic week my friend. These statements are trying, frustrating, and at times, a little obnoxious but I think I’ve come to realize that some people just lack tact/common sense. Thank you so much for writing this! 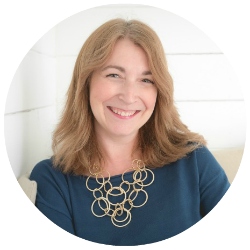 I want to homeschool as you know and I love when experienced homeschooling moms dispel the myths and assumptions. One thing people keep telling me anytime I ever make a complaint about motherhood being hard is that I’ll definitely not be able to handle homeschooling. As if I have to be the perfect mom who just LOVES every second of the day to be eligible for homeschooling. I love how you pointed out that no matter what your background or personality type, since you KNOW your children, that alone qualifies you over everyone else. That’s so reassuring. 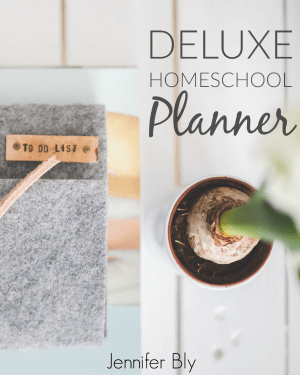 Seriously looooove your homeschooling posts so much! I’m glad you enjoyed this. I need to come up with really witty responses to all of these too. Maybe that’s a future post *wink*. It’s crazy how people just drill homeschoolers (and about to be homeschoolers) about these things! 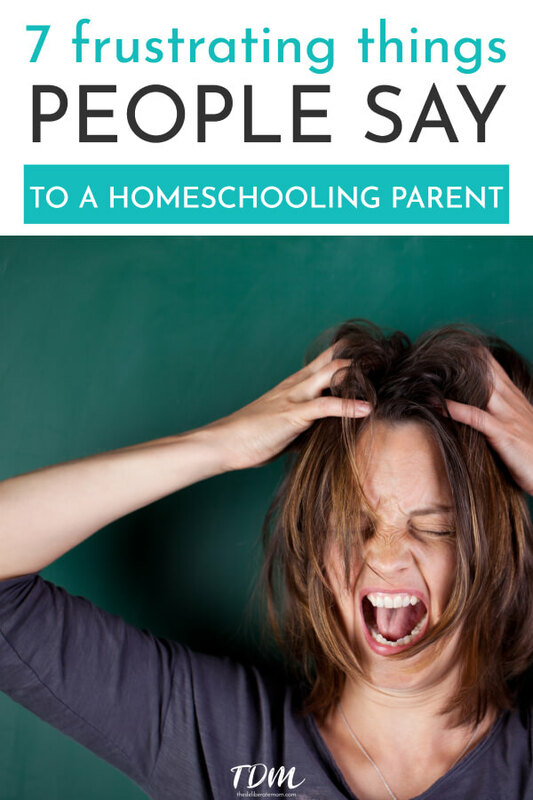 I need to work on my follow-up post… Witty Responses to the 7 Frustrating Things People Say to Homeschooling Parents. Great post and definitely things I have heard! Oh my goodness! I have little patience too and YES, I get that comment all the time. I’m not a teacher but I’m sure my degrees (engineering) did not prepare me to teach math, or chemistry, or any of the other stuff I learned in college! We’ve heard the whole “oh you must have so much patience” quite often. My favorite is “I don’t know how you do it”. Sounds like a compliment doesn’t it? I’m not sure it is, because I work full time, outside of my home. I do the planning, and husband (who I’m fortunate is home during the day) deals with the kids and making sure the work gets done. So I always wonder if they are really saying “you aren’t doing well by them, you work!”. I’ve heard all of those too… patience and the “I don’t know how you do it”. Ah yes, the things people say. People have a lot of misconceptions about homeschooling, especially the socialization part. My daughter is in public school but I enjoy the days she has off of school most because I get to be her teacher for the entire day. The socialization part is the most unnerving. I’m so tired of hearing that line. Thanks for sharing your thoughts on this Melissa! Thanks for sharing, Jennifer. Tweeted so hopefully others in your same position know they aren’t alone! It seems to me, when it comes to talking about homeschooling, many people unfortunately don’t think before speaking *sigh*. Great post, Jennifer! Thanks for the perspective. Thank you Jenny. I’m glad you enjoyed it. I’m a teacher with a DL school (& I homeschool my own kids). One question I get in regards to being a homeschool support teacher is “How do you know the parents aren’t doing all of the work for the kids?” Yes, because that’s every mom’s dream – to do several levels of math, LA, science, history, etc all day long while the kids play. Ha! That made me laugh. Yes, why would ANY parent do all that work? I DID NOT know there were rules on numbers! I’m going to have to look into that. Since my husband is a farmer, many people immediately start asking me about child labor laws, etc. Seriously? Reading, math, history folks. Wow! The things people say and assume. Thank you fro sharing your thoughts on this. Aimee’s comment made me chuckle too. People ask you about University at your girls’ ages? That’s just bizarre! Although I get it, my husband and I married when he was 25. One very young and naive young woman once asked me if we were going to have children right away, because he was older….. Sheesh! I know! Like seriously… university! They are 7 and 3! Ohhh Jennifer, I LOVE this post. We’ve been in the homeschooling arena for over 15 years (though Kathilynn gets all the credit, certainly none for me–I do scripture study and maybe wrestle with the lot of the for recreation).. So this hits home for us. “… define socialization and tell me why schools get all the credit for “socializing” our children? If we’re talking about the opportunity to make friends, my children have plenty of chances to connect with other children and to interact with members of our community. Ok, your University response almost made me fall out of my chair, I laughed so hard. Now I hear the “Aren’t you worried they won’t be at the same level as the other kids?” a lot. Now Jennifer–I’m certainly not going to argue the ‘good parent’ point here, because it really is by definition (so I agree with you there)…but I feel to plug you and everyone else who home schools. You ARE a good parent to the extent that you have chosen to take responsibility for your child’s education. At whatever level you are able to do so, that very decision and commitment, in my opinion, should be commended. Sooooo, I think you ARE a good parent BECAUSE you homeschool. Yeah, I don’t get the last statement. Never heard it, either. Have many friends who have one or two kids and homeschool. Hmmmm. Curious. I can tell when you enjoy a post Jaime… it’s reflected in your knuckle-cracking and in the length of your comment! I love that you enjoyed this… and your perspectives on these things that are frequently said to homeschooling parents. I’ve only been homeschooling for 2 years and I’m already tired of these one-liners! I totally LOVE your privately educated line. I want to use that one. Thanks for sharing your thoughts on this Jaime. We sometimes used the term “privately tutored” rather than homeschooled. People would look at us like we were the best parents ever who were truly dedicated to providing our kids with the best education possible. Which was true. Homeschooling IS essentially private tutoring. That idea was what sold me on home education in the first place, even before we had children. Oooh, privately tutored… I might have to try that one!! Homeschooling isn’t always easy or fun, but I wouldn’t change. When I see my children getting to excel at what they love, one-on-one help with what they’re struggling with and giggling with each other while they’re working I know I’d wouldn’t want to be doing anything else. I’m so glad you enjoyed this Jennifer. Yes, it’s hard work, but as you said, it’s soooo worth it! Yes, people say some pretty ridiculous stuff and much of the time, it’s not their business. Thank you for your kind and supportive words Meg. Some of these make me wonder do people actually think before speaking or just blurt out the first thing that comes to mind? Personally, I admire all homeschooling parents, and I desperately want to homeschool but unfortunately I can’t because it’s illegal in Croatia. There was a proposal to allow for it but was denied because “parents aren’t qualified like teachers”. Yes, sometimes I wonder if people think before speaking. It’s unfortunate that Croatia doesn’t support homeschooling. It’s such a rich experience. Most of the time folks are asking questions about homeschooling because they can’t imagine anything other than the traditional school experience. Sometimes it feels like explaining the difference between pink and red to someone who was born blind. Public education is just so ingrained in our culture that it is a huge leap for folks to consider another way. That is frustrating. I babysat quite a few homeschoolers and all are now in college, and not only that, REALLY good colleges. And they have friends and boyfriends and activities too. What?? The only problem I see with this is that I’m old enough to have my old babysitting charges now be adults. I heard most of these when I homeschooled. Very annoying and all wrong. I would also hear “Are you Mormon?” Because I homeschooled 3 kids at once. My favorite though, “Isn’t that ILLEGAL?” Lol! Homeschool is a fantastic opportunity and blessing! I never regret the 7 years I did it! I get so many comments since we are going on year 3 of waiting for babies. ” Just adopt” — “go on vacay” — ”just stop trying” etc etc! I just realize I need to give people grace, because they have NO idea how hurtful their words are! I can so relate. This year I’m homeschooling just one of my 3 school-aged children, and while my school has been supportive they just can’t seem to understand why I would choose to do that. Children are different. They don’t all want the same things or thrive in the same environments. I feel like my choice is to treat my kids as individuals with different needs, skills and dreams. It has been the best choice for our family, and I’m happy with it. Yup. I’ve heard many of those as well. Socialization, please. I had a conversation with a friend today that I think maybe we’re doing too much and that maybe we should stay home more! :) I never knew you had to have a certain amount of kids to homeschool. Ha! So first of all, I can’t believe there are only 7! And second, really, the “You’re a good parent” one bothers you? I would think it would be a compliment…but I’m not in your shoes of course! I think the same thing, how selfless and loving homeschool parents are. In this day and age so many people need dual incomes, or want a career because they can’t “handle” their kids – so it’s refreshing to meet homeschool parents. Thank you for sharing what NOT to say, and I have to tell you I enjoy reading your homeschool posts immensely. I go back and forth about it…and you give me hope! LOL. I totally sensed your frustration throughout this entire post! I’m sorry, I brought up socialization in our group shortly have you posted this!!! I wasn’t up to date with my RSS feed!!! I really enjoy reading about homeschooling and learning from experienced homeschooling mothers. Part of me wants to homeschool my children and the other part of me says NO I CANT DO IT. I don’t know… I’m scared I would lose my sanity entirely. I just do not know. Luckily, my two babies are still little so I don’t have to make any decisions right now. 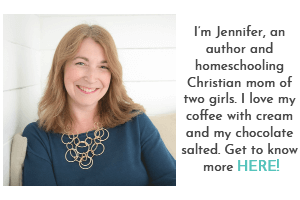 Hi Jennifer, it’s only since I started blogging that I have really become aware of people homeschooling their children. It’s not something I was really aware of before. As parents we want whats best for our children and if a parent embraces the chance to homeschool their child/children then good for them and why shouldn’t they? I would never consider it as I am just too disorganized, but when the children were younger I spent hours with them teaching them to read in English and Greek (quiet funny as my Greek really leaves a lot to be desired!). Now there level of education is far beyond me and it is all Greek to me (literally!). That hasn’t stopped me enjoying walks with them and continuing to educate (or try to) them on other non academic things. Walking the dogs we see things and chat. Driving somewhere we see things and chat. Watching television we see things and chat. Eating dinner together we chat…All the while I hope that in some small way my children are continuing to learn and grow. Most parents want their children to be educated and it’s up to them how they go about it, as long children are being educated properly then does it really matter how? I can imagine that homeschooling allows children to learn in a fun and relaxed environment….Good on you Jennifer! (And all other homeschooling parents!). People do not think through the things they say before they say them. I mean, “you must be a good mom…” wtf! As opposed to what, a mom who has kids in a traditional classroom? Us terrible folk? So annoying and yet hilarious! I know, right?! It makes no sense whatsoever! Sorry I’m late to responding. I’m trying to play catch-up! I’m pleased to say that so far I haven’t encountered any ignorant, annoying statements from people. Some are impressed, some have no comment beyond “Oh, ok” and others want to know more and where they can go to get started. Occasionally I get a comment about how I manage having the kids home all day, every day, but it’s said with admiration, not disdain. I laugh and say, “One day at a time and a glass of whiskey at the end of the day!” Then I say “Joking aside, it’s not that bad. Their attitudes have improved so much in the last year. We also do a lot of things outside of the home which helps immensely.” I often use humor to diffuse a situation and it works wonders. You are so right, humour often does wonders with diffusing a situation. I’ve encountered so many odd questions and insulting questions but on the plus side, I’m becoming a lot more comfortable with it. Thanks for sharing your thoughts on this Cindy! I got, I can’t believe you don’t have to have an education to homeschooling. Really? Um, I have one and it doesn’t take a degree to know how to teach my kids. I taught them to walk, talk, eat with utensils, use the toilet, read and many other things. That one kinda hurt. 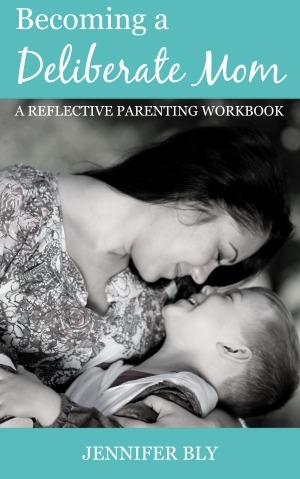 Yes, these are the common questions every homeschooling mom is facing. The very first question is about socialization. Why people are so worried about homeschooling children, its the parents who have decided for their child growth and success. Great presentation out of your experiences. The socialization question is probably the one that bothers me the most. Why the concern? I see so many children who are in the school system who don’t appear to be “socialized” or civilized! I’ve been thinking about my responses to these questions and how to educate others without being overwhelmed but it does get wearing at times. Thanks for sharing your thoughts on this Ashley. What about “I think you’re mad, you are totally jeopardising their future, they won’t fit into society” and this from my siblings!! OH wow – yes… that would be frustrating! I was just told by a cousin who teaches speak therapy in California that I should make sure my son is in “groups”. A principal of a school (friend at a campsite) said that home schooled kids are just told to memorize facts. In public schools they form in groups and work through things such as as problem solving. The socializing thing really makes me mad. Family and friends think I am ruining my son from experiencing public school and the real world; that he won’t be prepared for the real world. Bullying, standing up for yourself. Those skills he wont have. That’s what they are referring to. Making friends for life, etc. NO. Both of my nephews in different cities hated, just hated high school. WHAT?! I think it’s the schools that make kids just memorize facts… it’s the homeschoolers who get understanding and mastery because they’re not being rushed through a broad curriculum. There are so many children who hate school. I feel so fortunate that I’m able to homeschool my girls. Plus my girls have many friends and ample opportunity to work with others. They are an active part of our community – which is so important for everyone – homeschooled or not. It is very frustrating! I always get asked about “socializing” and my answer is, “maybe read about homeschooling and you’ll find out”. They talk to me like I’m weird or something..lol!